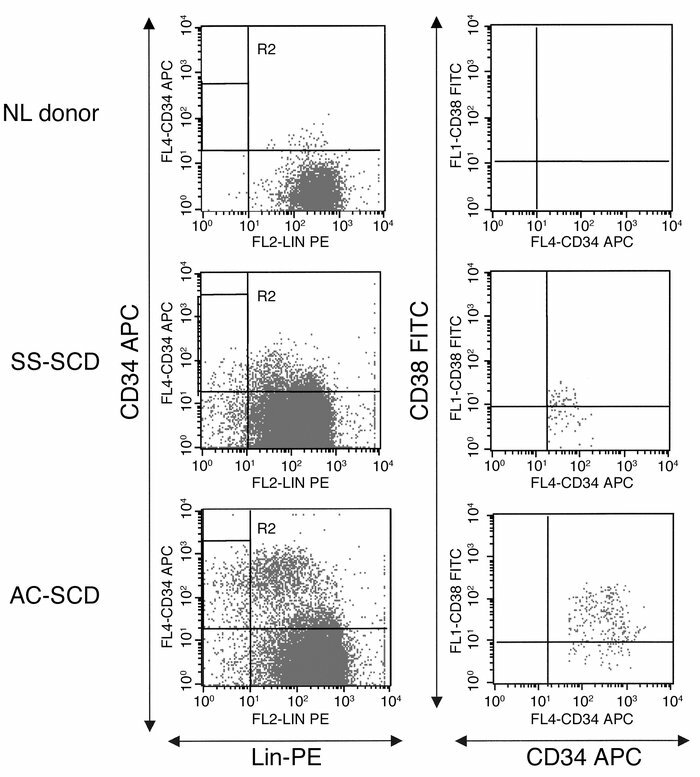 FACS analysis for CD34+CD38–Lin– cells in PB of NL donors and SS-SCD and AC-SCD patients. CD34+ cells were selected as described in Methods, stained with CD34 APC, CD38 FITC, and lineage phycoerythrin (Lin-PE) antibodies, and selected by FACS. Live cells were gated in R1, and then CD34 cells were gated against lineage cells. R2 represents the CD34+Lin– gate. Cells in R2 were gated as CD34 versus CD38. The R3 gate, CD34+CD38– (not shown here), was used to sort for single-cell deposition for assays.